Kees Kaldenbach with Andew Graham-Dixon by the Rijksmuseum. 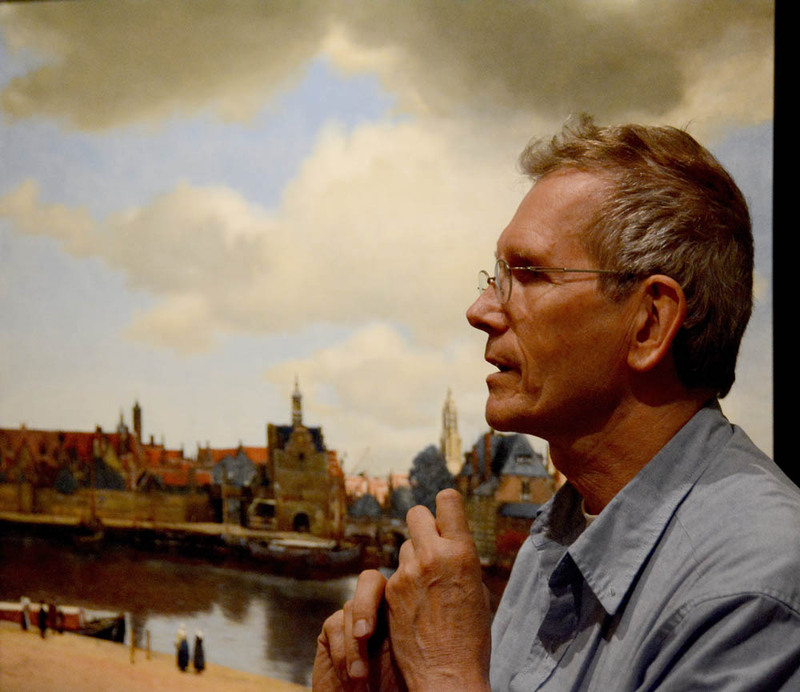 Drs Kees Kaldenbach is based in Amsterdam, where he is the highest paid tour guide and where he teaches in the field of art guide, a remarkable specialisation – with Master Classes, for a professional fee. 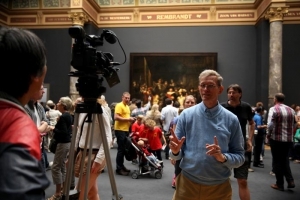 If you are living elsewhere in Europe, and if you prefer to study in another location – these Master Classes can take place anywhere in Western Europe, as long as there are good fine art museums, see the list under International Tours. Art historian Kaldenbach also leads tours for VIPs and Board members. Are you an art historian? I hope you are, for this study and diploma is an important minimum study requirement to start off with. In exceptional cases, a life long study of fine art and museums can also be a valid jump board. Are you looking for a career switch? 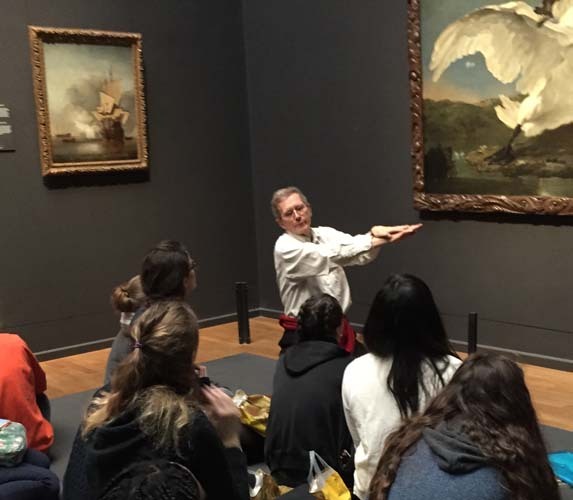 As a professional art historian pursuing a specialised career in Museum Guiding, an outstandingly good museum guide can earn between E 60 and E 150 per hour, taking small groups of 2 to 8 clients into museums. After a successful career lasting 20 years, Drs Kees Kaldenbach now accepts private students for teaching seminars. These will take place one-on-one or in very small groups. Kaldenbach (red jacket) with private client having a good time, 2018. Photo by Wulfsberg. 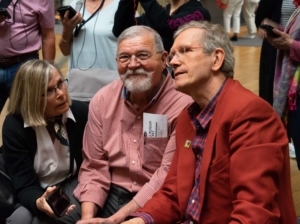 There are a number of essential qualities and teaching tools defining the top art guide. I will set out these qualities and give hands-on classes in Amsterdam museums and also in my private home (or if you wish elsewhere in Western Europe). For international travel to you I will bill additional cost like hotel, flight, taxi, meals etc. Take a chance! (as Abba sais). 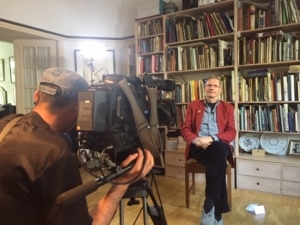 “Kees Kaldenbach accompanied a Samuel Courtauld Society visit to Amsterdam and Haarlem in May 2017, to support a Professor from The Courtauld Institute of Art. His organisation was extremely efficient. 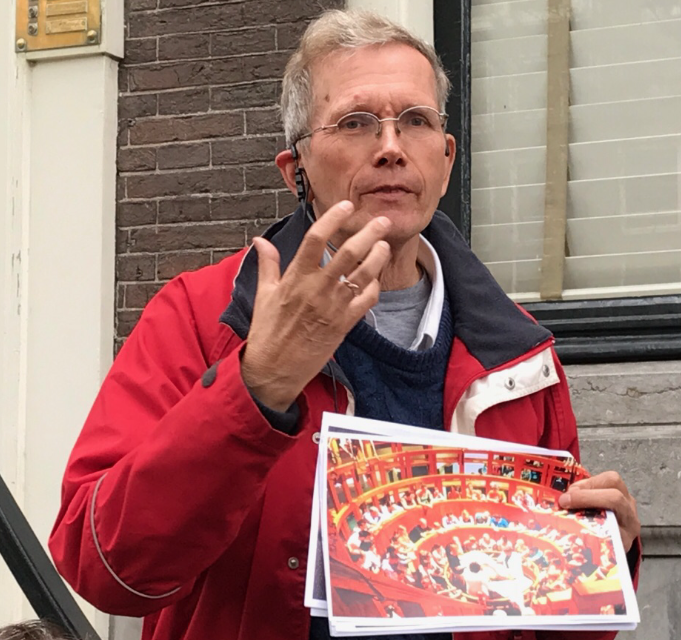 He was well-informed about the history and culture of the Netherlands across all historical periods, communicating a wealth of up-to-date information in a lively and accessible way. “Pontificating” in his library. TV Film teams drop in many times. In the Mauritshuis, 2018. I was guiding four clients. A lady was keenly eavesdropping and I invited her in for the next short subject, a talk about the Goldfinch by Fabritius. „Dear Drs. Kaldenbach, I want to thank you for including me “for two minutes” today during your tour session. It was very nice of you to perceive my interest in knowing more about The Goldfinch painting. The information was extremely interesting to me. 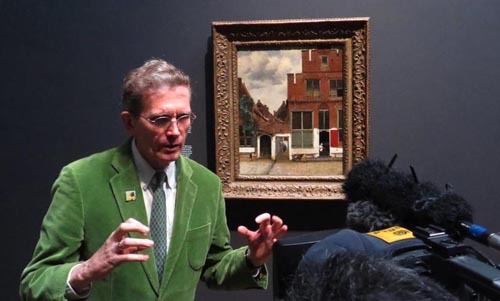 I have been to a few museums during my visit to Amsterdam and paid for tour guide’s services. However, I learned more from you in those two minutes than an hour with others. Your kindness to include me was appreciated and want you to know your knowledge about art is inspiring.